The key must be carried because the key carries an immobilizer chip that must communicate with the engine controls at short range. The engine can be started when the push button start is pressed from off, ACC, or ON. The push button start system functions (function which can start the engine by only carrying the key) can be deactivated to prevent any possible adverse effect on a user wearing a pacemaker or other medical device. If the system is deactivated, you will be unable to start the engine by carrying the key. Consult an expert repairer, we recommend an Authorised Mazda Repairer for details. If the push button start system functions have been deactivated, you can start the engine by following the procedure indicated when the key battery goes dead. After starting a cold engine, the engine speed increases and a whining sound from the engine compartment can be heard. This is for improved exhaust gas purifi cation and does not indicate defect of the parts. Make sure you are carrying the key. Occupants should fasten their seat belts. Continue to press the brake pedal fi rmly until the engine has completely started. (Manual transaxle) Continue to press the clutch pedal fi rmly until the engine has completely started. (Automatic transaxle) Put the vehicle in park (P). If you must restart the engine while the vehicle is moving, shift into neutral (N). (Manual transaxle) The starter will not operate if the clutch pedal is not depressed suffi ciently. (Automatic transaxle) The starter will not operate if the selector lever is not in P or N and the brake pedal is not depressed suffi ciently. Verify that the KEY indicator light (green) in the instrument cluster and the push button start indicator light (green) illuminate. If the push button start indicator light (green) fl ashes, make sure that the key is being carried. If the push button start indicator light (green) fl ashes with the key being carried, touch the key to the push button start and start the engine. If the KEY warning light (red) illuminates, or the push button start indicator light (amber) fl ashes, this could indicate a problem with the engine starting system and the inability to start the engine or switch the ignition to ACC or ON. Have your vehicle inspected at an expert repairer, we recommend an Authorised Mazda Repairer as soon as possible. Under the following conditions, the KEY warning light (red) fl ashes after the push button start is pressed to inform the driver that the push button start will not switch to ACC even if it is pressed from off. The key battery is dead. The key is out of operational range. The key is placed in areas where it is diffi cult for the system to detect the signal (page 3-7 ). A key from another manufacturer similar to the key is in the operational range. (Forced engine starting method) If the KEY warning light (red) illuminates, or the push button start indicator light (amber) fl ashes, this could indicate that the engine may not start using the usual starting method. Have your vehicle inspected at an expert repairer, we recommend an Authorised Mazda Repairer as soon as possible. If this occurs, the engine can be force-started. Press and hold the push button start until the engine starts. Other procedures necessary for starting the engine such as having the key in the cabin, and depressing the clutch pedal (manual transaxle) or the brake pedal (automatic transaxle) are required. When the engine is force-started, the KEY warning light (red) remains illuminated and the push button start indicator light (amber) remains fl ashing. 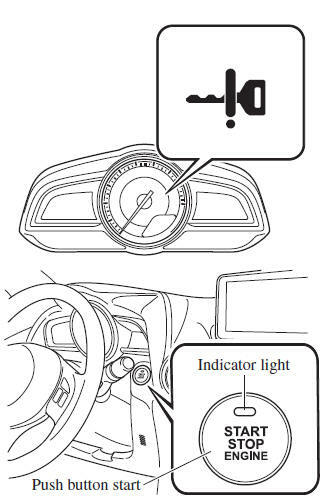 (Automatic transaxle) When the selector lever is in the neutral (N) position, the KEY indicator light (green) and the push button start indicator light (green) do not illuminate. Press the push button start after both the KEY indicator light (green) in the instrument cluster and the push button start indicator light (green) illuminate. After starting the engine, the push button start indicator light (amber) turns off and the ignition switches to the ON position. (SKYACTIV-G 1.3, SKYACTIV-G 1.5) After pressing the push button start and before the engine starts, the operation sound of the fuel pump motor from near the fuel tank can be heard, however, this does not indicate a malfunction. When starting the engine, do not release the brake pedal until the glow indicator light in the instrument cluster turns off and the engine starts, after pressing the push button start. If the brake pedal is released before the engine starts, depress the brake pedal again and press the push button start to start the engine. If the ignition is left switched ON for a long period of time without the engine running after the glow plugs are warmed up, the glow plugs may warm up again which will illuminate the glow indicator light. The starter does not rotate until the glow indicator light turns off. After starting the engine, let it idle for about ten seconds (Prohibited in Germany). (Germany) Drive immediately after starting the engine. However do not use high engine speeds until reaching the operating temperature. Whether the engine is cold or warm, it should be started without the use of the accelerator. If the engine does not start the fi rst time, refer to Starting a Flooded Engine under Emergency Starting. If the engine still does not start, have your vehicle inspected by an Authorised Mazda Repairer (page 7-24 ). (SKYACTIV-D 1.5) If the ambient temperature is lower than about - 10 °C (14 °F), the maximum engine speed may not be attained for about three minutes after the engine starts to protect the engine. Manual transaxle vehicle with i-stop function) If the engine has stopped due to stalling, it can be restarted by depressing the clutch pedal within 3 seconds of the engine stopping. The driver's door is open. The driver's seat belt is unfastened. The clutch pedal is not released completely after the engine stalled. The clutch pedal is depressed with the engine not stopped completely.